Switzerland. Famous for its holey cheese, beautiful, clean brown cows, discreet banks – “we’ll do business with anyone” – and countryside that looks like it’s been washed and combed every morning. 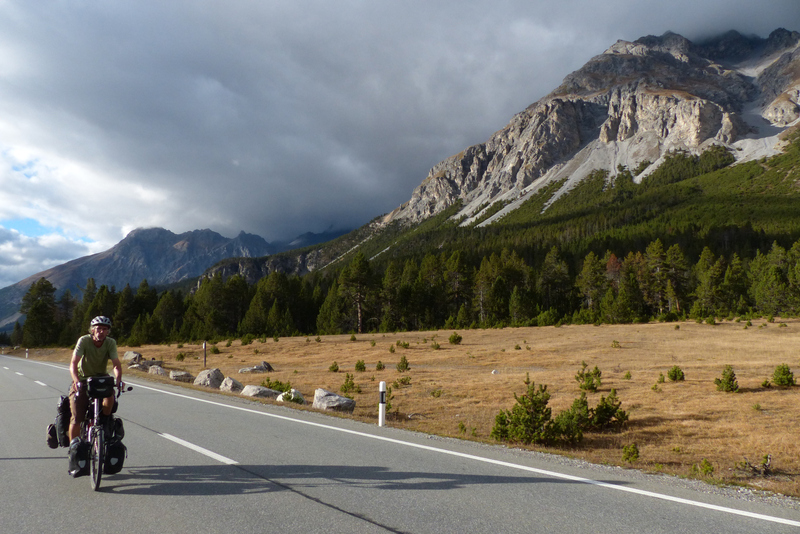 For cyclists, however, Switzerland is known for another reason: the Alps and its passes. Panorama of Basel seen from the observation point at the Münster Cathedral. 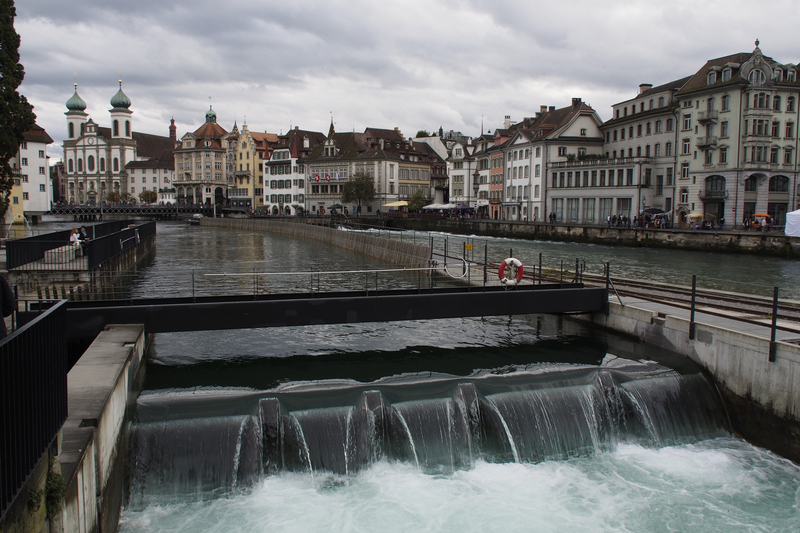 We had been looking forward to Switzerland with some excitement and perhaps a smidgen of trepidation. Would we be up to the task? 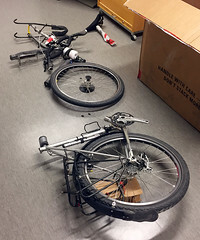 Our bikes are pretty heavy. Paul’s, with a couple days food on board, is carrying something like 35 kilos or a bit more (we have not weighed it as the reality would be too difficult to face), and Jan is packing about 30 kilos. 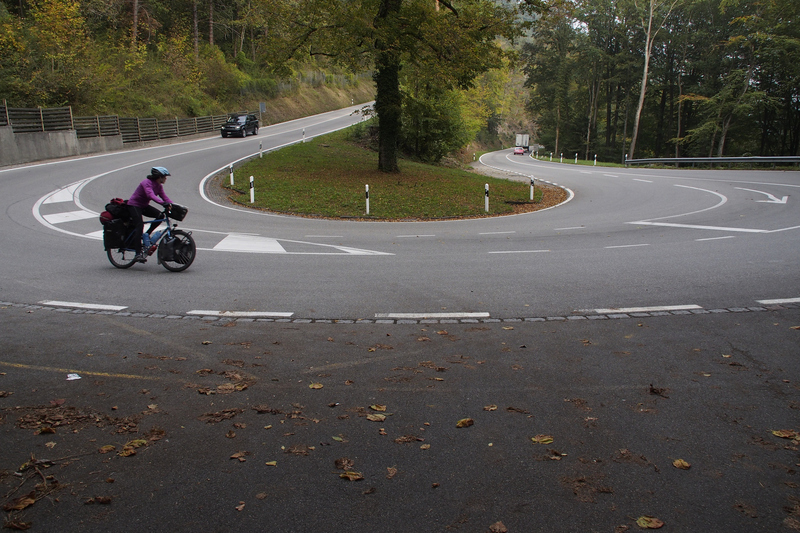 Jan negotiating one of the hairpins on the way to Auer. We had not picked out a route as we have been leaving our itinerary quite open during this trip, to go where ever we fancy. It’s nice not to have an agenda. The only thing guiding us was the fact we would meet our friends Ivona and Gary in Bolzano, Italy, around the second week of October. 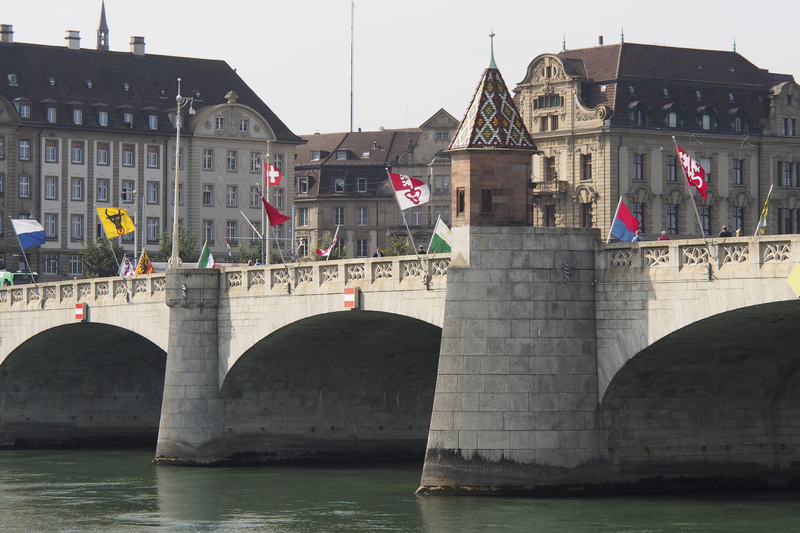 One of the bridges crossing the Rhine in Basel. After consulting with a few people we came up with a route that would take us over three big passes. We had arranged a stay with a Warm Showers host in Davos and hoped we would find camping along the way for other accommodation. 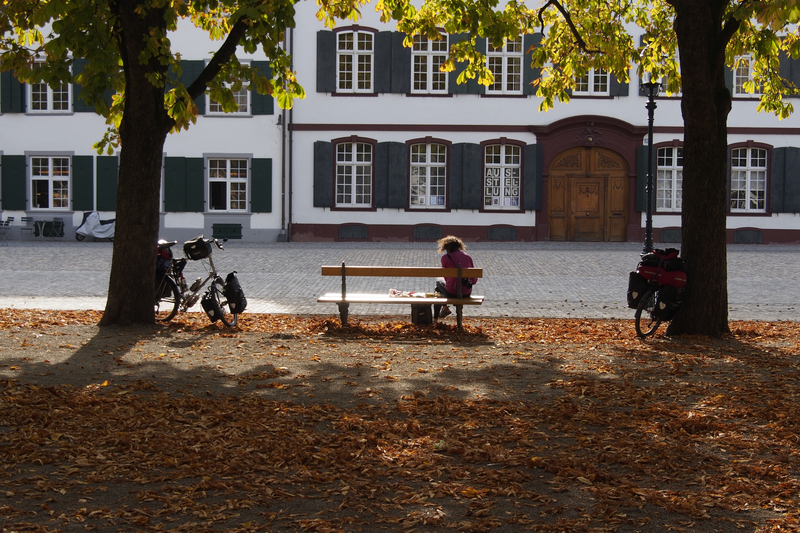 We cycled around Basel for most of the day and eventually made our way to a campsite along the Rhine in one of the suburbs, however, when we arrived there it was closed for the season. As it was late in the day, and we did not feel like finding an expensive hotel we decided to stay there anyway. The water was still turned on so we would be able to cook and wash. Taking a lunch break in Basel. We cooked our dinner at one of the picnic tables as the sun set and by the time we were done it was quite dark so we pitched the tent in a secluded corner right along the river bank. So, we stealth-camped in Switzerland. It can be done! Even in a big city like Basel. In the morning we had the tent down and made breakfast before anybody wandered by along the trail and we loaded the bikes to explore the Roman ruins around Kaiser Augst. Kaiser Augst, an old Roman settlement on the outskirts of Basel. The Romans built an extensive fort here at around 300 AD, called Augusta Raurica, that grew to be a large city, complete with temples, theatre, amphitheatre and a spa. 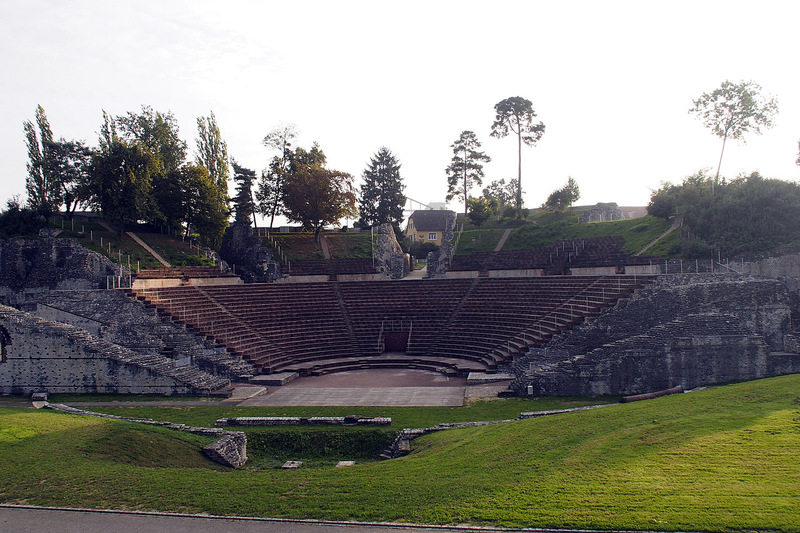 The amphitheatre was not discovered until the 1950s in an overgrown hillside. Part of it has been uncovered now. Jan cycling through one of the tunnels. We followed the Rhine Route east before turning south toward Luzern by taking a regional route that offered us a bit of climbing to help us get that burning feeling back into our legs. We hadn’t really climbed anything since Norway and we spent more than a month cycling through the flat lands of Sweden, Denmark and Germany, with the exception of a bit of climbing in the south of Germany. 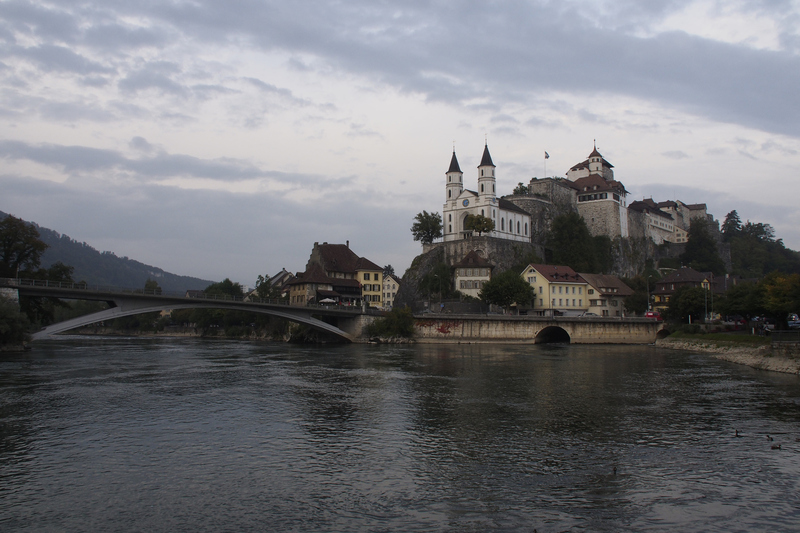 We camped in the beautiful old city Aarburg along the Aar River. Aarburg along the Aar River. 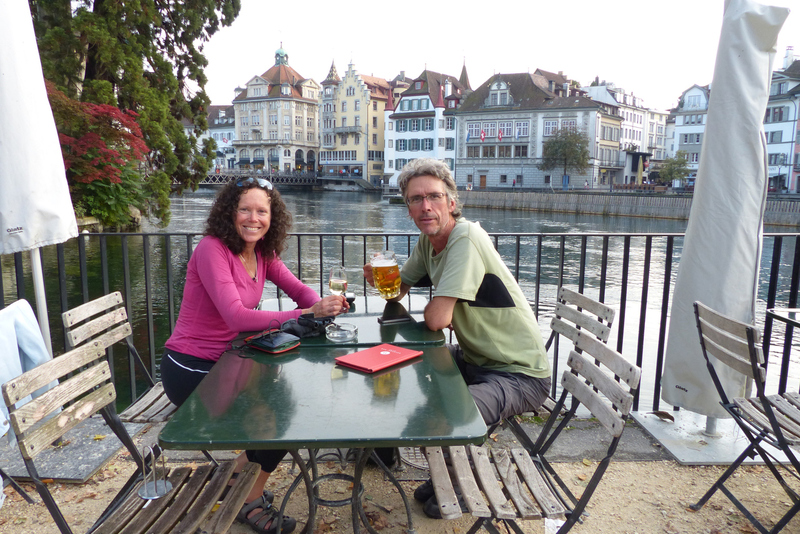 We arrived in Luzern after a great day of cycling. The sun had finally come out in the middle of the afternoon and it was warm when we found ourselves on a lovely square with several cafés so we had a drink and lingered in the sun, watching the well-dressed Luzerners going about their business. Having a drink in Luzern. 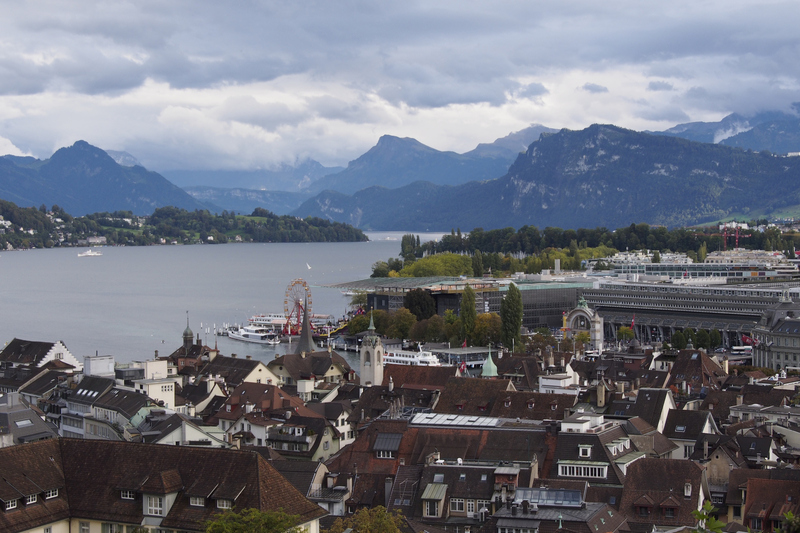 View of Luzern and the lake. We found a huge campground just out of the town centre where we made our home and decided to stay another day to explore this beautiful city. We cycled and wandered around Luzern, climbed the hill up to the old castle to get a view of town, not really paying attention that it was Saturday and the grocery stores closed early. By the time we got around to getting our groceries, everything was closed, except a gas station, where we could buy some basic items and, of course, beer and wine. We are still not used to the grocery stores not being open on Sunday and we’ve been caught a bit short on food on a few occasions. We rode out of Luzern along Lake Luzern aiming for the Alps. 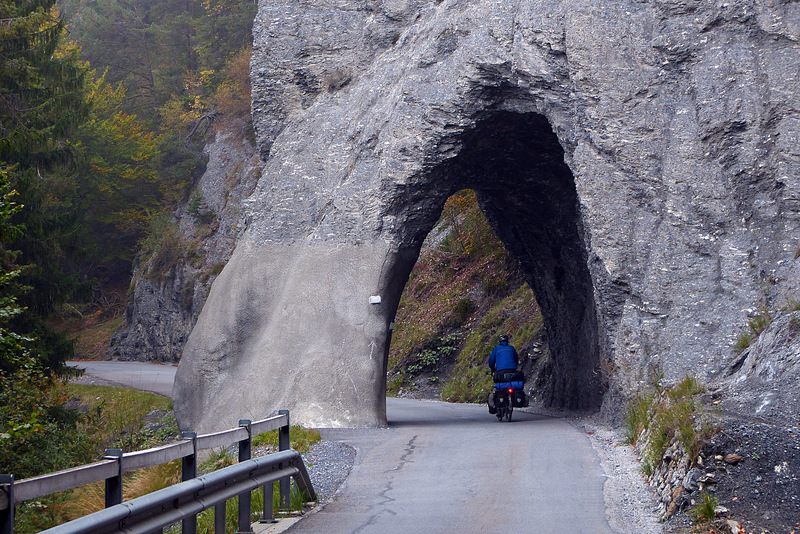 We rode southeast on one of the national cycle routes to the ski resort of Andermatt. 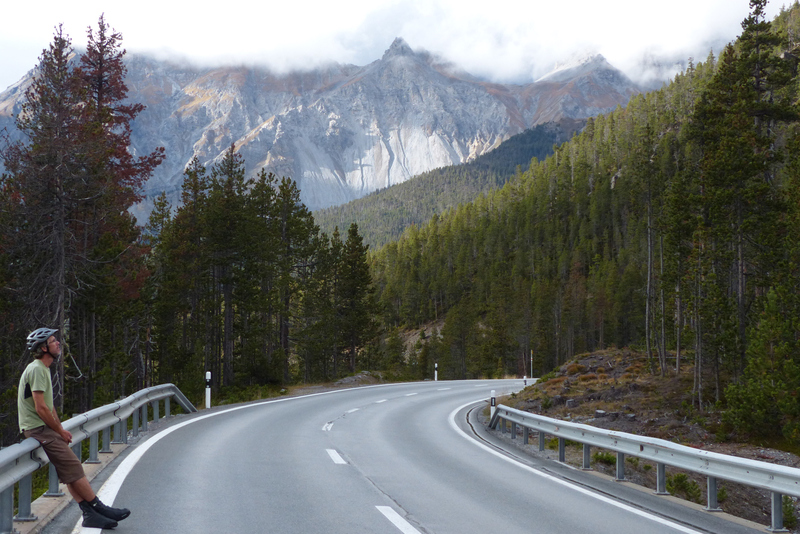 The ride was fairly gentle for the first 65 KM but after that we climbed for 30 KM, gaining almost 1,000 metres in altitude, especially the last 10 KM from Göschen to Andermatt was steep on a busy road through tunnels and snow sheds. 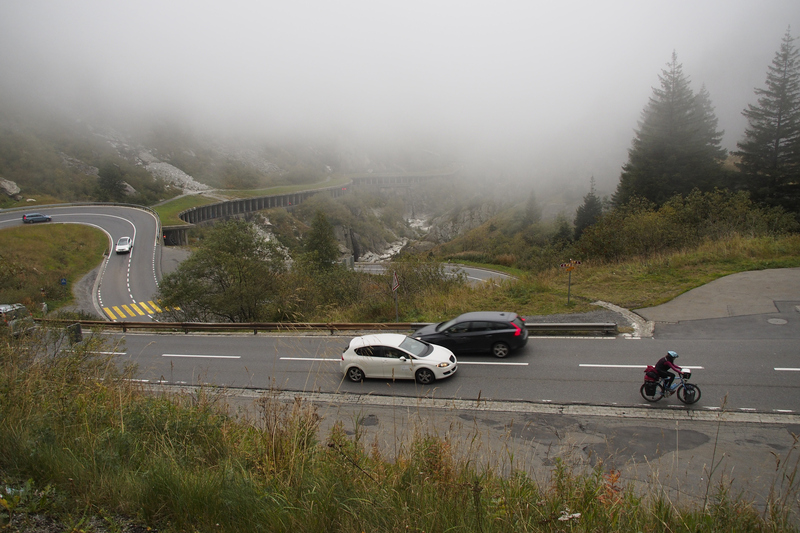 There was non-stop traffic coming from Italy through Gotthard Pass, trying to avoid the busy tunnel. By the time we arrived in Andermatt, it was getting dark. It was also cold at 1450 metres and the campground closed for the season. After looking at a couple of places, we ended up getting a room at Gasthaus Skiklub for a pretty good price, including breakfast. The dinner in their restaurant was very good and beautifully presented, so, we carbo-loaded after the day’s climb, and also anticipating the climbing yet to come. We were tired. It was a long day of nearly 100 KM with 30 KM of climbing at the end. 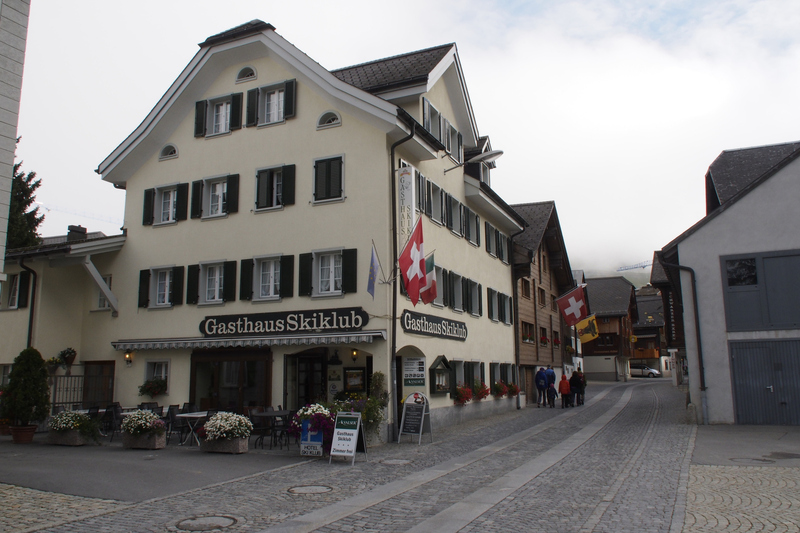 Our accommodation in Andermatt: Gasthaus SkiKlub. 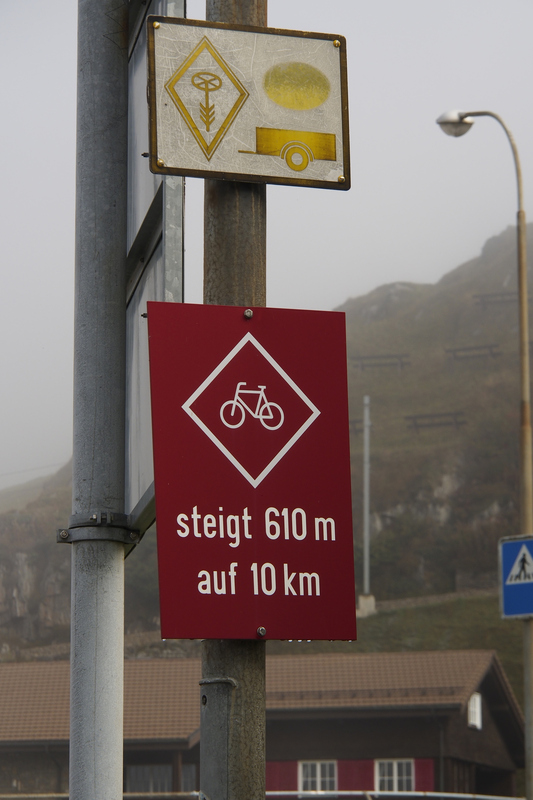 A sign warning of the climb ahead to Oberalp Pass. The next day dawned sunny, a welcome change from the cloudy, foggy day we’d had before. 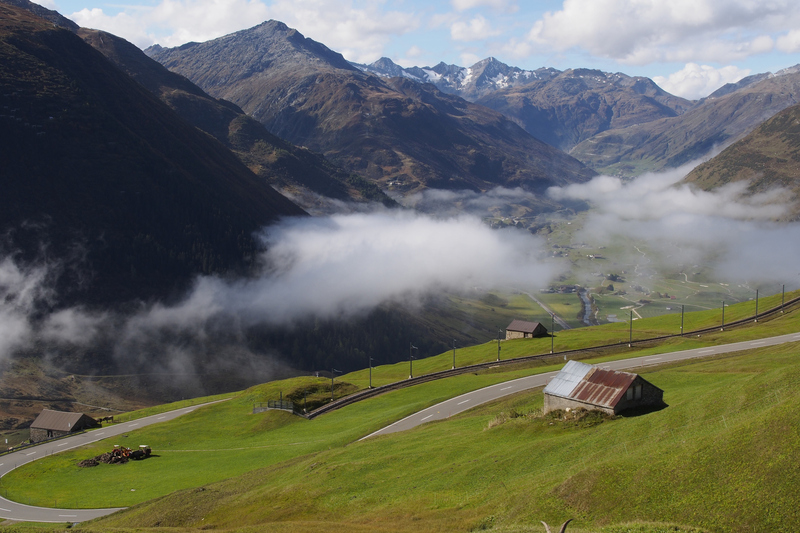 In Andermatt the fog stuck to the streets but as soon as we climbed out of town we got into the sunshine as we ascended Oberalp Pass at 2046 metres, another 1,000 metres above Andermatt. 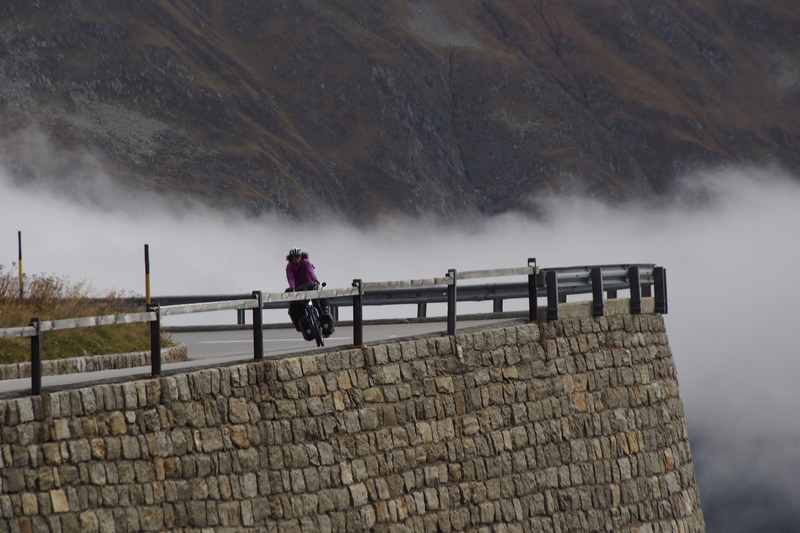 Paul climbing Oberalp Pass in the fog. The climb up to the pass was much easier than the day before. A bit less steep at a steady 6-7 per cent for 10 KM, one-third of the distance on the road we did the day before. It was sunny and beautiful and the Alps were before us in all their splendour. Amazing! We had a very expensive coffee and cake at a restaurant in the pass and soaked up the alpine views before heading down. The descent was fantastic. Equally steep and about 30 KM long. It’s tempting to just let gravity take you down as quickly as you dare, but then you miss all the beauty laid out around you. So, every few minutes we stopped to soak up the views and take some photos before rocketing down some more. Looking back toward Andermatt while climbing up to Oberalp Pass. Jan coming down from Oberalp Pass. Eventually, we found ourselves in the Rhine Valley again, but this time near its source. The mighty Rhine that flows through half of Europe is a small stream here as it flows east. It is clear and clean and you can drink the water, something I wouldn’t dare further downstream. We cycled on small roads and tracks along the Rhine and began climbing again into the Rhine Gorge after a grocery stop in Ilanz. We found a lovely camp site in Carrera, a small town in the Gorge. We were the only people there. The season is really over as most camp sites have shut down. We are a couple of stragglers, I guess. The cycle route along the Rhine in the Alps. 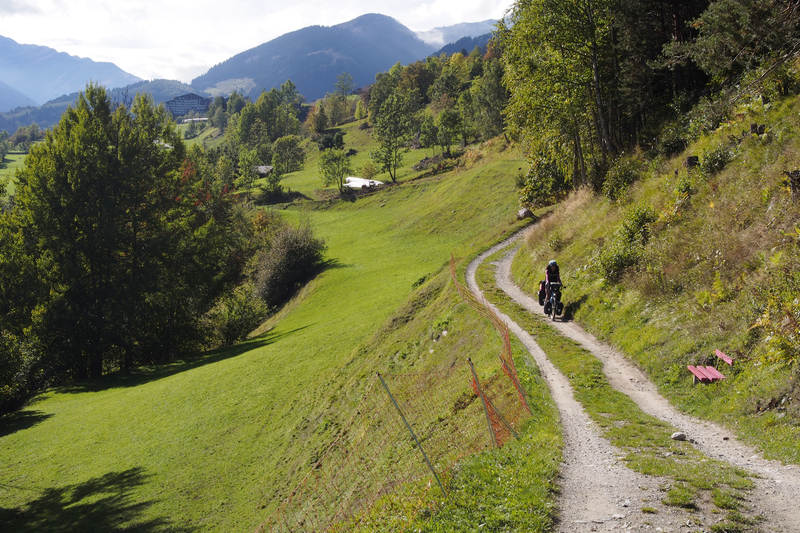 We followed the Rhine route to Bonaduz where we turned onto another Swiss national cycle route, the Graubünden. Along the Rhine Gorge west of Carerra. 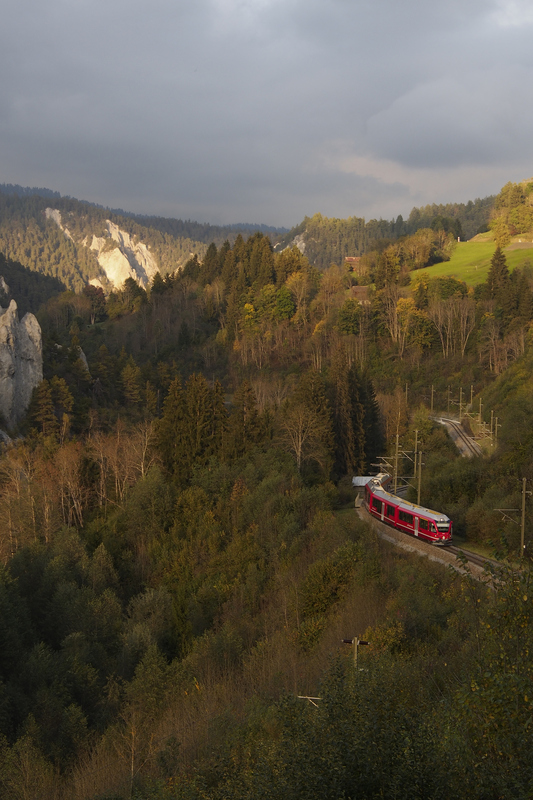 A valley along the Rhine in the Swiss Alps. The Rhine gorge near Ilanz. 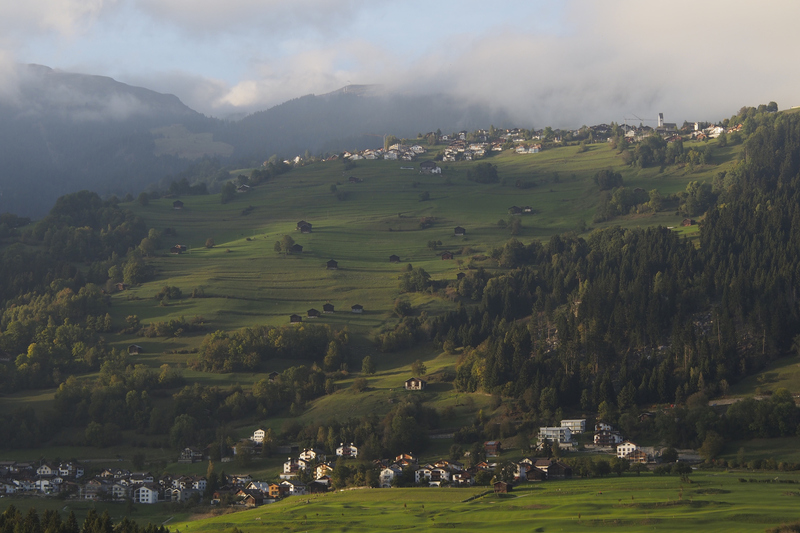 We followed the Graubünden route as far as Tiefencastel and turned northeast to Davos, the highest city in Switzerland, according to the marketing people. We had arranged a stay with a Warm Showers host there. Alex and Fabrizio were very welcoming in their emails and we looked forward to meeting them. They also gave us some good information which helped us in planning our route. Paul digs into a Nutella and peanut sandwich at lunch. 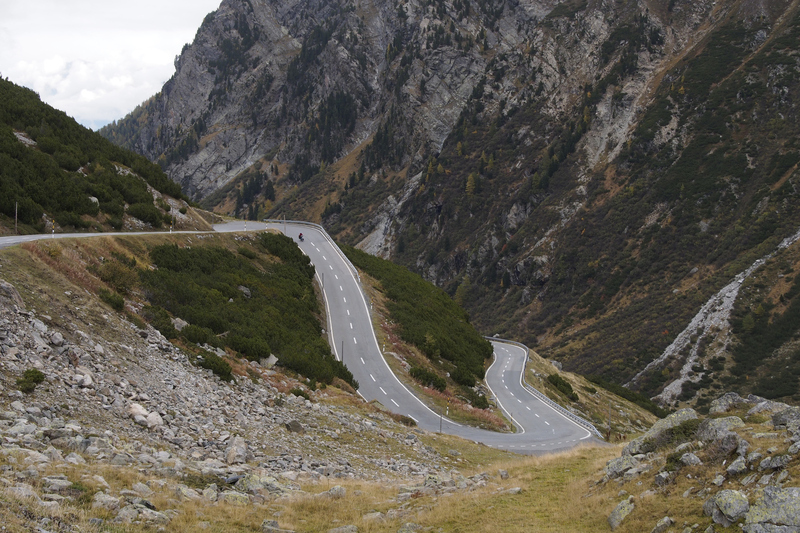 The road from Carerra to Davos was a tough one as we climbed and descended all day long. Our net elevation gain on that day was 1,600 metres over 73 KM, with some steep, 8% pitches along the way. 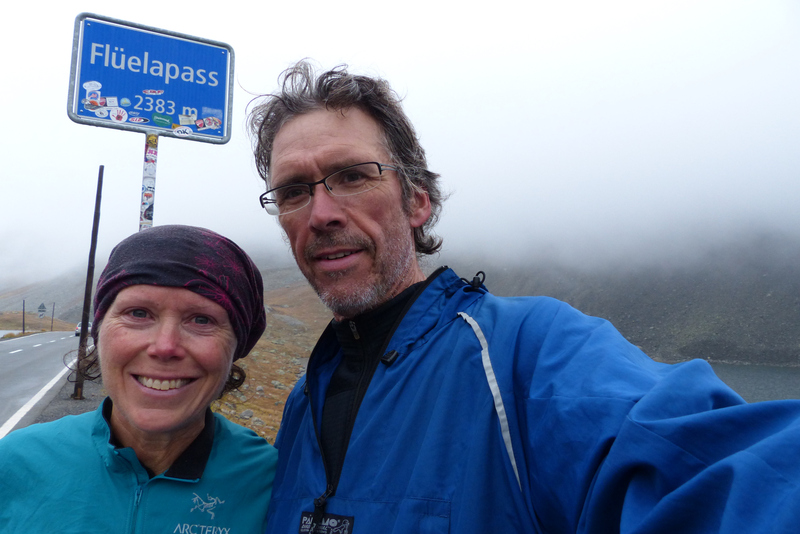 It was cold, especially as we climbed up to Davos at nearly 1,600 metres above sea level. 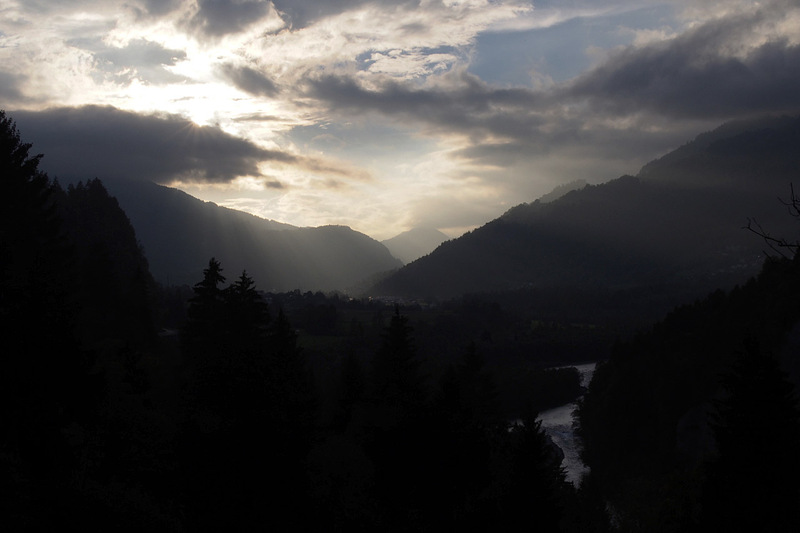 The light bursting through storm clouds above the Rhine gorge near Ilanz. Alex had left a key for us so we could get into the apartment and she arrived home from work shortly after. A great, warm welcome. Unfortunately, Fabrizio was in Basel for work, so we did not meet him but I’m sure our paths will cross again some day. They are planning a big bike tour in North America in a couple of years and we will be able to reciprocate their fantastic hospitality. We had showers, did laundry and Alex cooked us a delicious dinner. We talked about our trip and the one she and Fabrizio had done in South America and we looked at maps of Canada with her to give some route suggestions for their planned cycling trip. 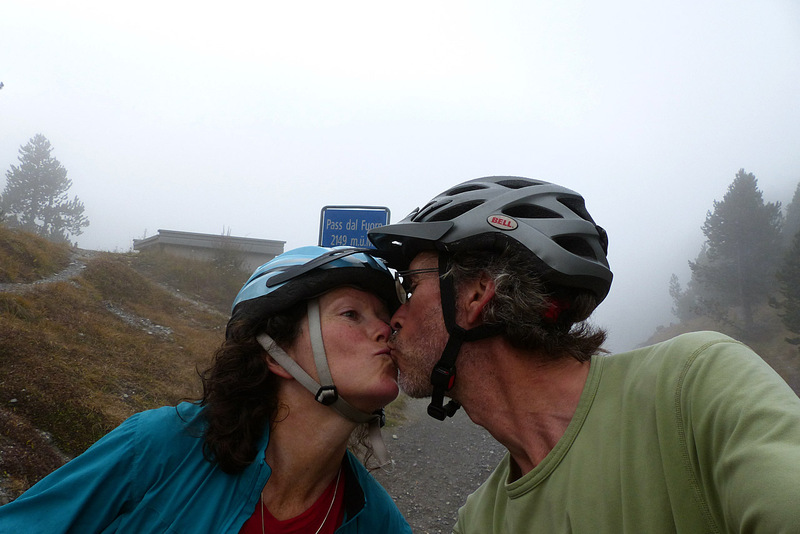 Climbing Flüela Pass in the fog. In the morning, Alex went to work and we had breakfast, packed up and headed out for another big day of climbing. 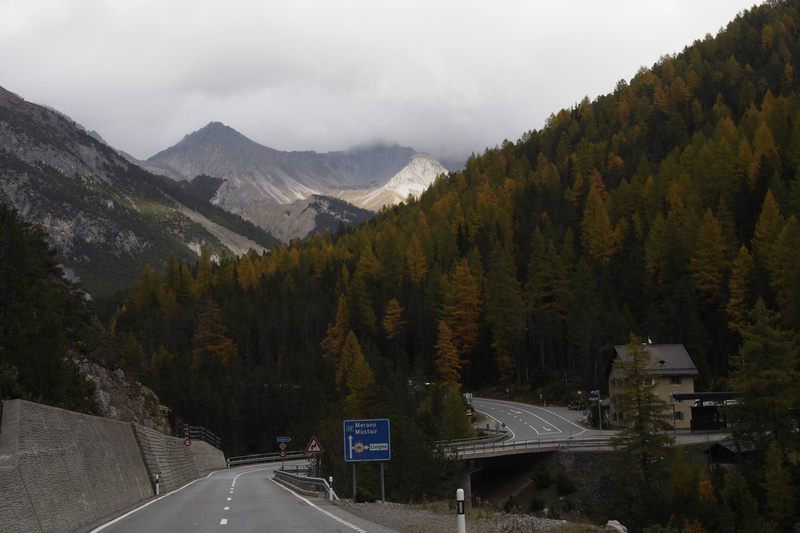 It was foggy and cold, probably only 5 or 6 degrees, and the climb up Flüela Pass begins immediately as you leave Davos. The climb is 17 KM long and ascends at a steady 6 to 7 % all the way, with some steeper pitches here and there. The weather remained cold and foggy so, sadly, we did not get to see much of the surrounding landscape. It took us two hours to get to the pass. There was no lingering. 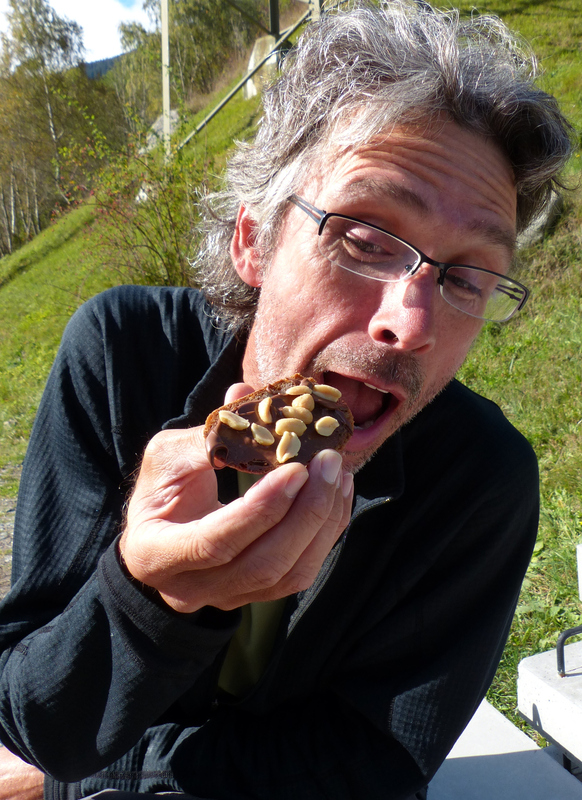 Just a quick photo, a snack and the donning of layers in preparation of the descent, which is 14 KM and steep. In less than 45 minutes we were in Susch at the bottom where we picked up the Graubünden route again. We carried on another few kilometres to Zernez where we took a long break with a lovely lunch in one of the restaurants in preparation for the next pass: Pass dal Fuorn, or Ofenpass. Pass dal Fuorn is not as high as Flüela but still a formidable climb at 2,149 metres. 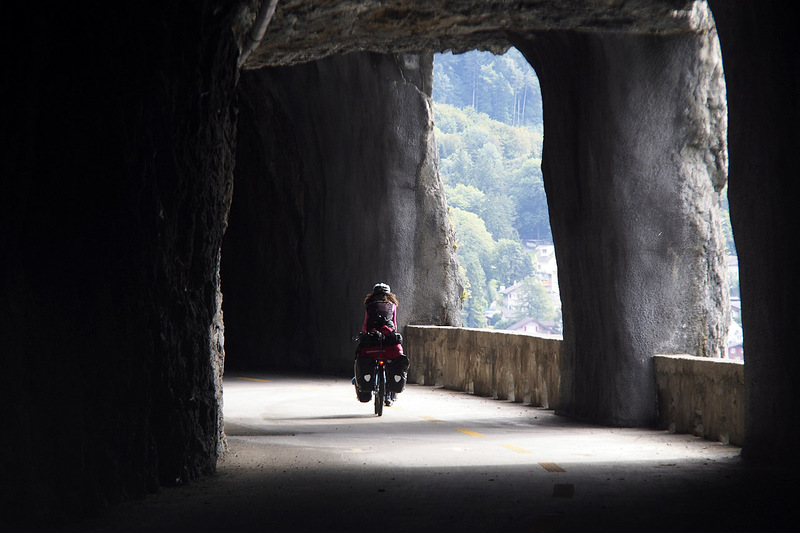 It’s a bit of a cruel one, too, because from Zernez you climb almost 450 metres up to 1,883 but then you drop almost 200 metres to 1700 before tackling the final grade up to 2,149. Looking ahead to Pass dal Fuorn. We did, however, get lucky with the weather. As we climbed, the fog disappeared and glorious sunshine revealed the stunning Alpine scenery. We had about two and a half hours of sun right until the last part of the climb when the fog rolled in again over the top from the east side of the pass. The Alps near Pass dal Fuorn. Paul admiring the Alps near Pass dal Fuorn. We met another cyclist at the top who had climbed up from Santa Maria, our destination for the day. Again, we put on all our warm clothing in preparation for a very steep 14-kilometre-long descent to Santa Maria near the Italian border. What had taken three hours to climb took a mere 40 minutes to descend. It was fast, with top speeds over 50 KM per hour. Not as fast as coming off Flüela where I reached a top speed of 67 KPH but that is too fast and I can only do that for very short stretches on good pavement before my nerves get the better of me. Climbing up to Pass dal Fuorn. 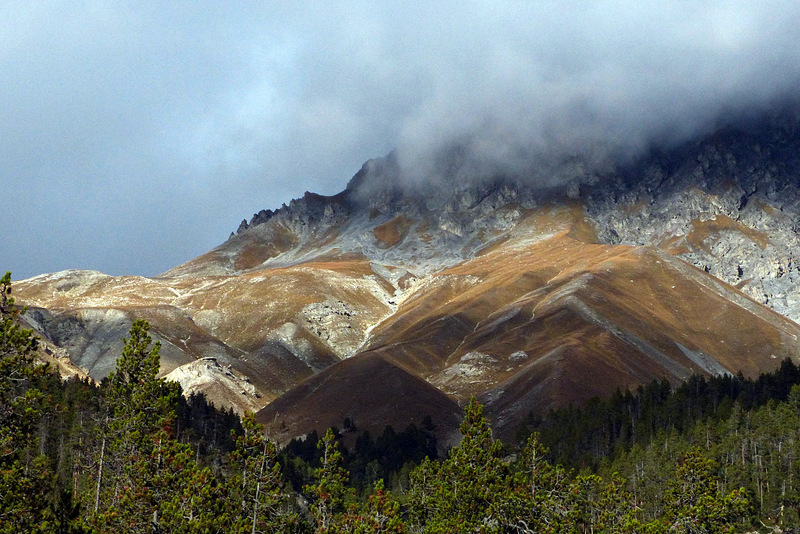 Santa Maria is still at 1,400 metres and it was cold. 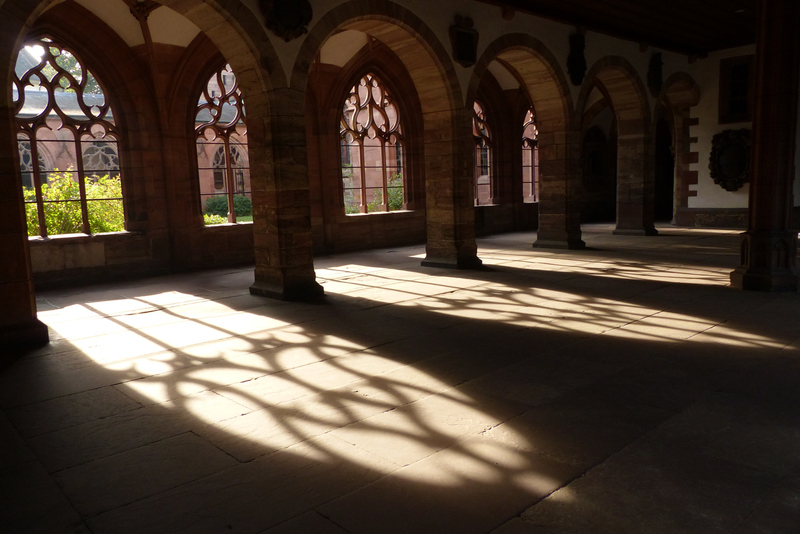 Luckily, there is a beautiful hostel there where we had a 14-bed room all to our selves. It had been a long day of 74 Km with almost 1,800 metres of climbing over the two passes. We went out for a big dinner at one of the local restaurants and crashed into a deep sleep. 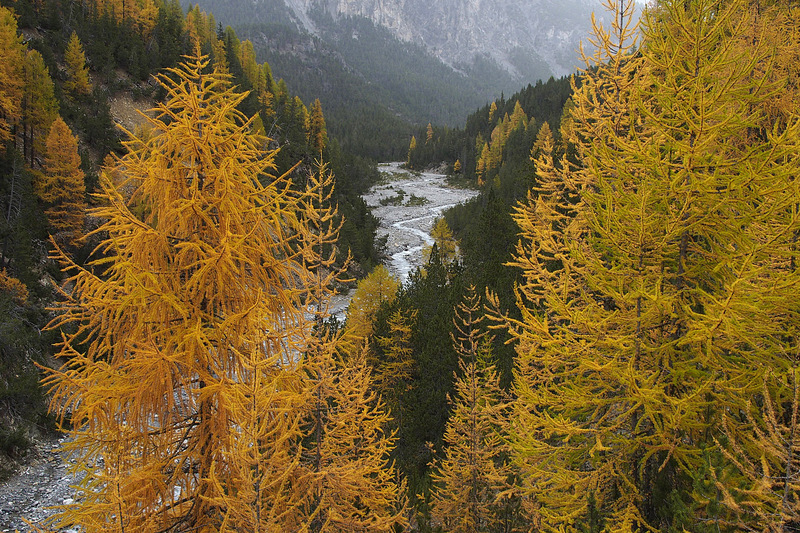 Fall colours in the valley leading up to Pass del Fuorn. The Alps were behind us now and we had timed it pretty well. Alex emailed the next morning to tell us there was 15 cm of snow on the ground in Davos. Cycling the passes would not have been possible. We got through just in time. From Santa Maria it would be all downhill into Italy and beyond. Pass dal Fuorn: 2149 metres. In total, we did quite a bit of climbing in Switzerland. The graph below shows the three passes over the course of 325 KM between October 6 and 9. We climbed a total of 6,006 metres. The road profile through Switzerland between Oct. 6 and 9. We did not get to see all of the spectacular Alp landscape we cycled through but were lucky in two of the passes to see some of it. It would have been nice to spend a bit more time in the Alps but it was just too late in the season for cycling. Time to head south where, hopefully, it will be warmer. Going home. 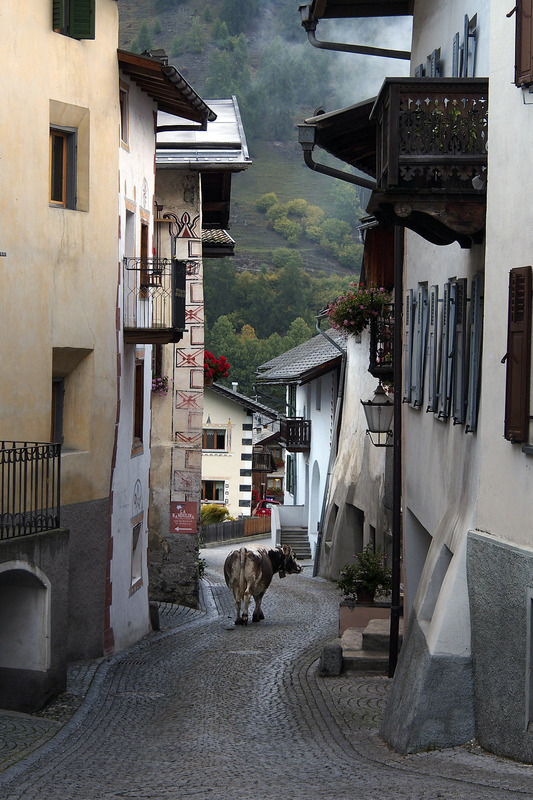 A lone cow in the streets of Santa Maria. Click on the map to open it in a new window and look at the route in more detail. Ain’t Europe fantastic and by the way, you have a great profile! A spectacular ride for sure. Love your posts and pics. Keep ’em coming! FYI, we have left our bikes in Munich and plan to return next year for another tour. Thanks, Dave and Melissa. Too bad we missed eachother. It has been amazing so far. We have some maps we can mail to you. Very impressive you guys! I can’t believe you climbed all those passes, and that late in the season. I really enjoyed the descriptions and the photos, as I know most of the places you have been. 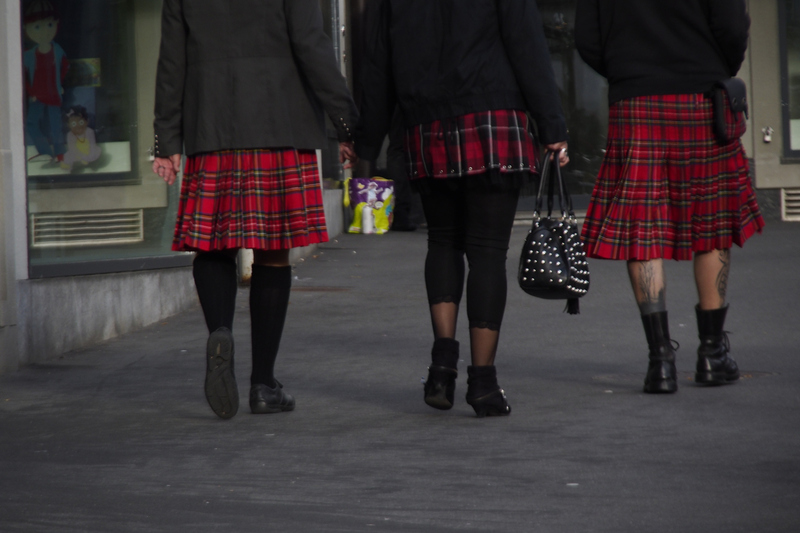 They made me a bit homesick … I’ll be in Locarno visiting my mother in late November. By then you will be well south, in warmer weather I hope. Great to hear that you’ve made it! You crossed the Alps. Hopefully it will become warmer. When in Slovenia I really recommend to try their wines. They started wine-making long before Romans and Germans.